Our team of HopeRaisers is made up of supporters, volunteers, friends and family. Churches, missionaries, pastors and children’s bible schools – anyone can become a HopeRaiser! 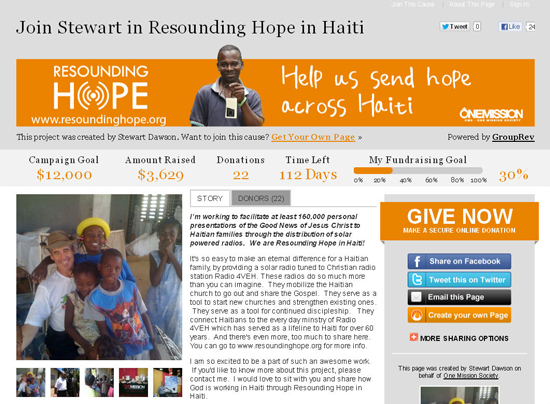 All it takes is the desire to help send a message of hope to Haiti! Become a HopeRaiser today and raise funds to sponsor solar radios for Haiti. We’ll provide you with fundraising tips and online tools to that allow you to track and promote your progress. You’ll receive your own personal fundraising webpage (like the one below) that you can customize with your own photos, videos and reasons for supporting Resounding Hope. Once your webpage is complete, invite your friends, family, colleagues, and neighbors to check it out! Help them learn more about our mission and ask them to help you meet your fundraising goal. Using your new webpage, anyone can make an online gift to support your efforts.